On July 21rst, the editors of Martha Stewart Living magazine decided to bring their water-cooler discussions about their favourite things to us, their readers, with a new blog called Our Finds. An offshoot of the magazine column of the same name, the blog intends to share what the department editors at MSL are discovering on a daily basis on the marketplace: people, places, shops, websites, products and inspiration. It all comes together to inform their work and fuel their editorial fires. I had not discovered the blog until today, actually, but I'm very glad I did. I especially like their Links We Loved This Week posts with connections to all kinds of sites, blogs and online shops that are sure to inspire. Be sure to check it out: Our Finds. The image above is from a collecting segment from the Our Finds column in the August issue of Martha Stewart Living. 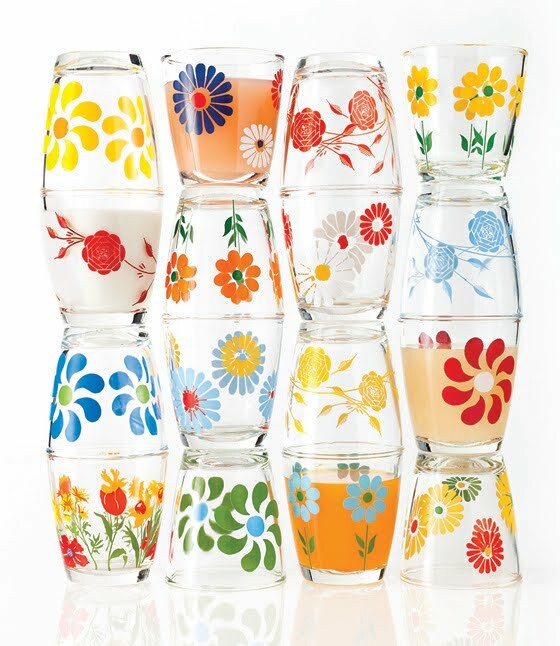 If you'd like to learn more about these quirky American giveaways, the book Sour Cream Glasses by Barbara Mauzy, a brief but informative manual on collecting these glasses, is a fun and colourful guide.